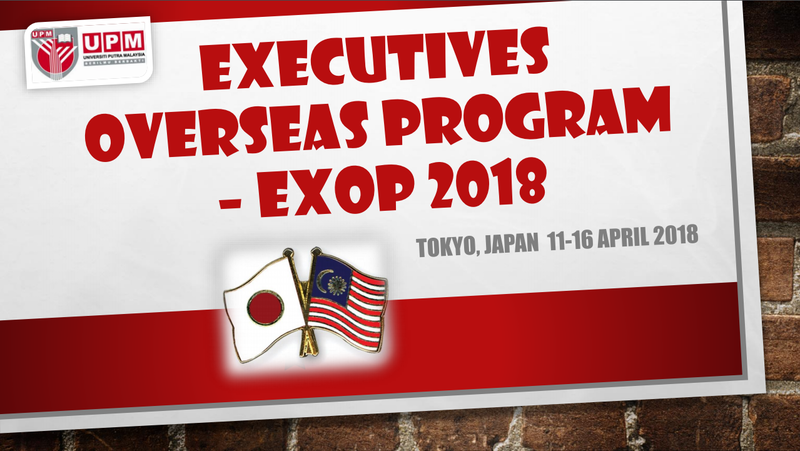 Executives Overseas Program (EXOP2018) was held on 10 - 17 April 2018 in Tokyo, Japan with the theme "Incorporationg Japanese Leadership Traits Into Future Malaysian Leader". The program was implemented in collaboration with a strategic partner, The Association for Overseas Technical Cooperation and Sustainable Partnership (AOTS) in Kenshu, Tokyo. AOTS is an organization focused on human resource development globally aimed at promoting cooperation with developing countries. Given the overwhelming response, however, since the AOTS has limited participation, the program is only attended by 30 people (including a secretariat). Participants are 20 from the Public University and 10 from the Statutory Bodies. The program is brilliant and achieves the goal. Participants are very pleased and give a very positive commitment to the program and support the full implementation of this program in the future. Participants also informed that there is an increase in knowledge that can be applied in carrying out daily tasks.